Steve Jobs' resignation: Where now for Apple? It was hardly a surprise. 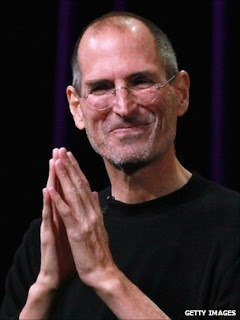 We have known for a long time that Steve Jobs was ill and rumours of his impending departure have repeatedly rocked Apple's share price over the last couple of years. But the news that he was bringing down the curtain on his illustrious career was still greeted with shock. After all this is the man who transformed the business he co-founded from an ailing also-ran into the undisputed champion of the technology industry - so it is natural to ask what Apple will be without Steve Jobs. First of all, it is important to recognise that the company has hardly been treading water in the six months since its CEO went on medical leave. Just look at the share price. It started the year hovering just above $300 and in recent weeks climbed briefly above $400, making Apple the world's most valuable company. We have also seen outstanding financial results and the successful launch of the iPad 2, which still has no substantial rivals in the new category of tablet computers. Remember, all this has happened under the leadership of Tim Cook, Apple's chief operating officer, who stepped into Steve Jobs' shoes for the second time back in January. Now he has got the job on a permanent basis, and the buzz in Silicon Valley is that he is the right man at the right time. He has apparently been the absolute master of the supply chain - what sounds like a dull part of the Apple operation but is vital to the firm's success. Tim Cook's career at Apple has been all about making sure that the process of manufacturing cutting-edge products and delivering them to consumers is done efficiently. He is widely credited with delivering the outstanding margins on products like the iPhone and iPad which have in turn delivered the profits which make the business so wealthy. It's not so clear that the new boss has his predecessor's instincts when it comes to how products should look and feel. But don't forget that the British design guru Jony Ive, who has masterminded the genesis of every new product since the iMac, is still on board. Together the two men could make a formidable team. In the autumn, we can expect the launch of the iPhone 5, promising to extend Apple's dominance of the mobile phone industry, in terms of profits if not market share. Then another iPad will be coming along, probably early next year. So in the short term, do not expect the Apple ship to founder. "It's in Apple's DNA that technology alone is not enough. It's technology married with the liberal arts, married with the humanities that yields the results that make our hearts sing." Somehow, you cannot imagine those words coming from Tim Cook. And will the new leader be quite as bold in taking Apple into uncharted territory, quite as confident that he knows what consumers want better than they do? No man is irreplaceable, and Apple is packed with brilliant engineers, designers and managers. The question now is whether it can continue to "think different" without the man who made that into a personal and professional credo.